LAKEVIEW — Adam Levitus never liked greeting cards. "The messages inside were either super sappy or really corny," he said. "Or they were trying to be funny — I didn't think they were funny, and the recipient didn't think they were funny, and there'd be this awkward, 'He he, thanks.'" So Levitus, now 26, started making his own cards in his early 20s. The structural engineer favored simple, funny and direct messages. For his teenage cousins who just wanted cash, he'd draw a stick figure jumping in a pile of money: "This card contains money." The relative who just had a kid might find a drawing with the words "Welcome to the family." And that close friend with a dry sense of humor? A middle finger seemed much more appropriate than "Happy Birthday," Levitus said. "What I made conveyed the message a lot more effectively than a Hallmark card." The Lakeview resident is hoping to translate his hobby into a business. 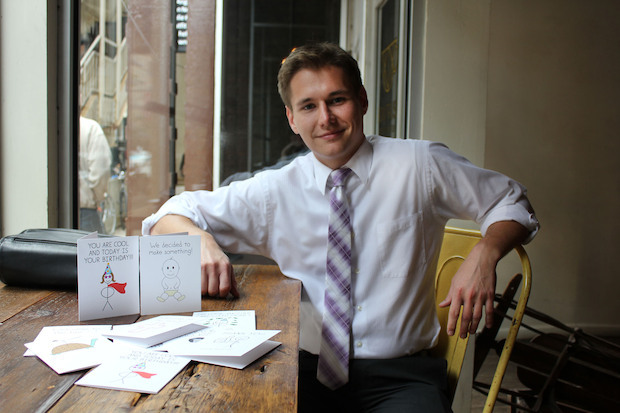 He recently launched Pithy Diction, a card line he creates at home and sells through the online retailer Etsy. Beyond an affinity for doodling, Levitus has no design background. Most of his cards feature stick figures or simple drawings on white paper. He thinks he'll find a fan base in people who are as sick of over-the-top, saccharine cards as he is. Levitus draws each card by hand, then refines and edits the images on his computer. He prints at home and charges $3.50 a pop with a 99-cent shipping fee. The goal is to eventually sell cards to local retailers, but for now, Levitus is happy on Etsy. "I've found the Etsy community to be very welcoming," he said. "And if you're going to Etsy to buy something, you're in a different mindset than someone who's going to the corner store to pick up a card right now in five seconds, and they don't care what it is. That's not my customer." To find Pithy Diction cards, click here.